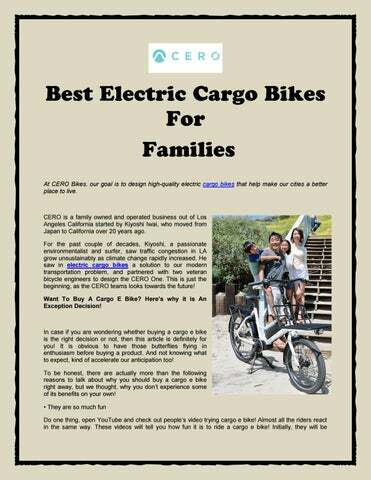 At CERO Bikes, our goal is to design high-quality electric cargo bikes that help make our cities a better place to live. CERO is a family owned and operated business out of Los Angeles California started by Kiyoshi Iwai, who moved from Japan to California over 20 years ago. For the past couple of decades, Kiyoshi, a passionate environmentalist and surfer, saw traffic congestion in LA grow unsustainably as climate change rapidly increased. He saw in electric cargo bikes a solution to our modern transportation problem, and partnered with two veteran bicycle engineers to design the CERO One. This is just the beginning, as the CERO teams looks towards the future! Want To Buy A Cargo E Bike? Here’s why it is An Exception Decision!